The Staple Singers were an American gospel and soul vocal group. In 1968 yet another change of record labels found The Staple Singers signed to Stax, which would signal the first real big change in their sound. Since the 50s they had pretty much stuck to the same formula of family group vocals backed by Pops Staples' electric guitar, singing gospel music. However on Stax they started to record with big, full band arrangements, complete with horns and strings. 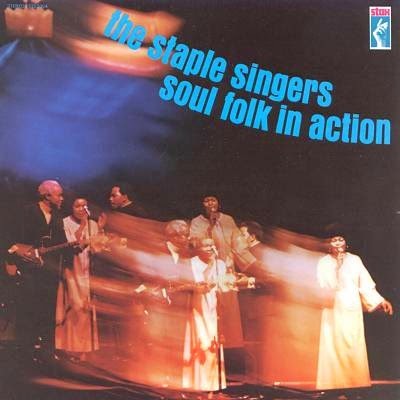 Their first Stax album, Soul Folk In Action, saw them backed by Booker T & The MGs. They were also no longer singing just gospel, though the 'secular' songs chosen for them all had suitable socio-political messages and their music still retained its spiritual core (they had actually been recording similar 'message songs' for the past few years). The songs on the album included some effective covers of Otis Redding's "Sittin' On The Dock Of The Bay" and The Band's "The Weight", plus "Get Ourselves Together" and "The Ghetto", two songs by Delaney & Bonnie Bramlett (Delaney & Bonnie had also been on Stax for one album, but their versions of these two songs interestingly didn't surface until their next album on Elektra records the following year). Stax also signed Mavis Staples as a solo artist at the same time, and the focus throughout Soul Folk In Action was very much on her as lead singer. There was also less room for Pops' guitar in the bigger arrangements.